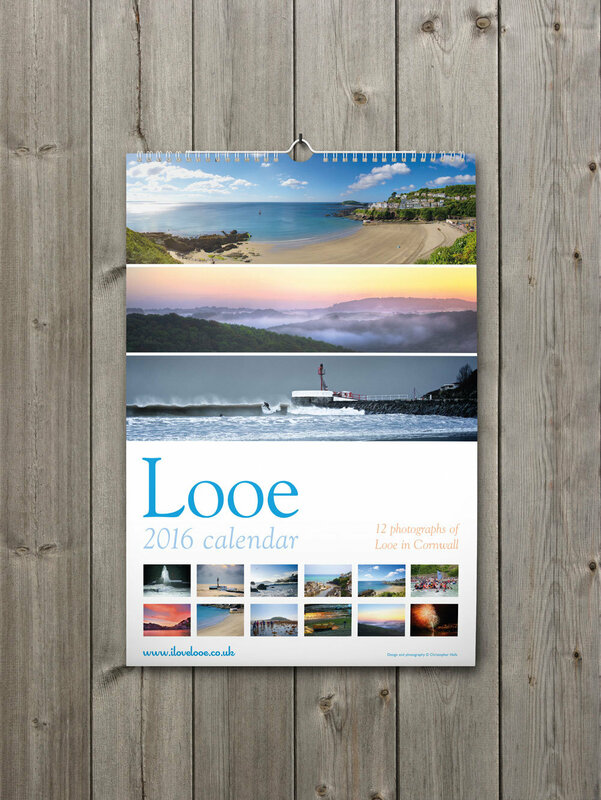 If you already have a copy of the new Looe calendar for 2016, then you’ll have seen the new images by now. If not, then I’m going to post them all below one day at a time for you to enjoy. Each photograph has a special memory for me, and although some details have been lost in the mists of time, I’ll be writing a quick overview about each one as I go. 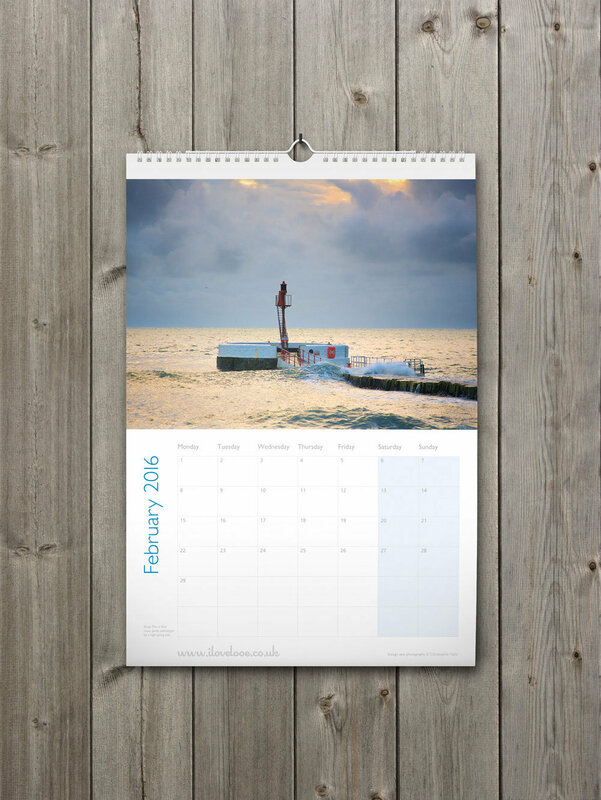 If you’d like a copy of the calendar for yourself or as a gift, please use the following link, sorry, sold out. 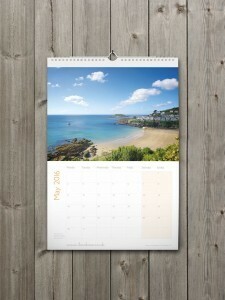 I deliver all over the UK and postage is the same for up to 4 calendars. Every year, I like to feature three panoramic images on the cover, that aren’t actually in the calendar. The reason for this is simply that these images just don’t work so well, when cropped to the inside image format. Plus, I don’t like to leave images out, that I feel are worthy of being in the calendar. TOP: This image is photographed from the South West Coast path as you head out of East Looe towards Plaidy. It’s one of my favourite spots to take pictures of Looe Beach. MIDDLE: Last year, having moved from a rather nice property along Shutta Road, we ended up staying for a month or so, in a long term holiday rental in West Looe. This was the view from the rear balcony looking towards Kilminorth Woods and Looe Golf Course. BOTTOM: Another and possibly my favourite photo, is of two surfers on East Looe beach. It was a stormy morning, with really intense, dark and brooding skies looming overhead. I like this image because I managed to catch the main surfer just breaking through the top of the wave. It was split second shot, and another one of those ‘lucky’ moments. This is the January photo from the new Looe 2016 Calendar. I photographed this image during one of the rare storms that manage to land on East Looe beach. The two surfers were constantly trying to catch the enormous waves but waiting for a wave to smash into the pier, just at the moment they caught the wave, took absolutely forever. As always, I think photography is based largely on luck! The photo caused quite a stir at the time on my FaceBook page and it’s one of my favourite action pics, taken in Looe. 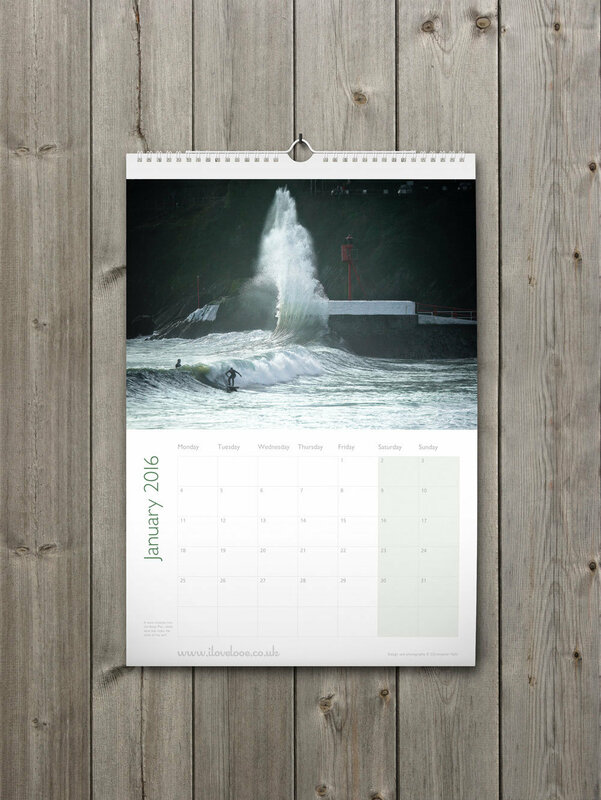 This is the February image from my Looe 2016 calendar, photographed in the morning, whilst standing right at the top of a deserted East Looe beach. I don’t remember whether the height of the sea was due to a particularly high tide or a storm that was making it’s way towards us. What I do remember however, is walking down to the seafront and feeling slightly overwhelmed by how high the sea was and how little of the beach remained. It was almost lapping against the sea defences! The powers that be, in Looe, are currently looking into ways of protecting the town against flooding from storms, spring tides and the effects of global warming. If that day in February was anything to go by, perhaps they can’t come soon enough. My March 2016 calendar image was photographed on a late winter morning, near the rocks at the far end of East Looe beach. I chose this picture because it brings back fond memories of early morning walks through Looe, across the beach from the Banjo Pier and up onto the coastal path, before heading home via the Wooldown. This particular morning the, was an off-shore wind, and the light was literally ‘sparkling’. I’m not sure if you’ve noticed it in Looe before, but quite often the air is so clean and clear, that the light seems to make everything glow! It’s a well known phenomenon further west in Cornwall, and places such as St Ives draw (no pun intended) artists from all over the world to paint and experience the magic of it. These ‘sparkle days’ as I call them, are some of my favourites and remind me why we moved here all those years ago. 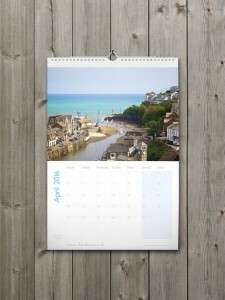 I photographed the April calendar picture last year whilst we were house hunting in West Looe. We went to look around a fabulous property with gorgeous views over Looe Harbour and out to sea. I thought, ‘Wow, the photos I could take for iLoveLooe if we lived here’. Sadly it was not to be, but I snapped this one while we were there as a reminder. One day maybe. 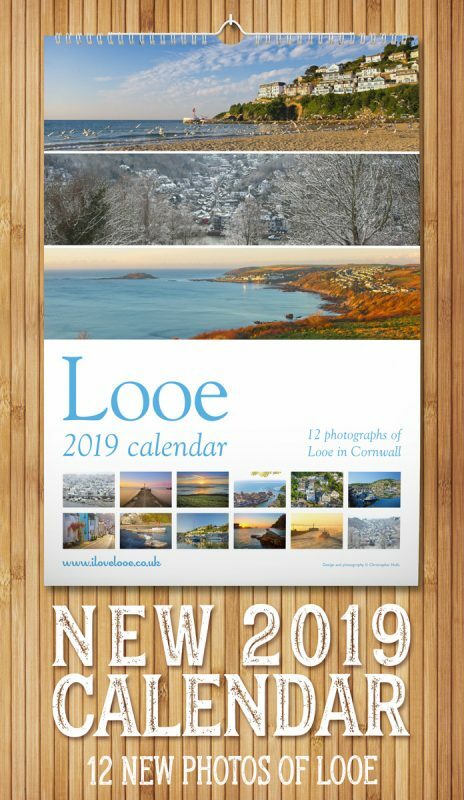 For the calendar picture, I’ve zoomed in on the Looe Sailing Club boats but what struck me the most was the fabulous turquoise blue of the sea. If you’ve been to Looe on the days when the crystal clear ocean waters roll in, you’ll know what I mean when I say it’s just like the Mediterranean. Quite often, it’s so clear that you can watch mullet and shoals of tiny sand eels swimming up river. It’s a such a beautiful sight and just like the ‘sparkle days’, another reason we moved to Looe. I’d love to know if you’ve moved to Looe, why it was? Please leave a comment below. P.S. 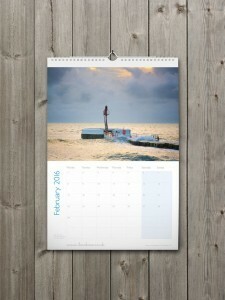 I only have 23 calendars left, so if you’d like one please pick up a copy asap. May is my absolute favourite month in Cornwall, and the May photo for the 2016 calendar is my favourite too. It’s photographed from the South West Coast Path up above the Looe Rowing Club, or thereabouts. Around Looe at this time of year the lanes a lined with flowers and everything seems new and full of potential. I often think of May as the calm before the storm! This is why I think this picture appeals to me so much. The bright blue sea, gentle waves, golden sands and the view over Hannafore towards Looe Island and beyond. The calmness if the scene sums up May for me. I’d be interested to know which is you favourite month in Looe. If you have a moment, do drop me a line or leave a comment below. 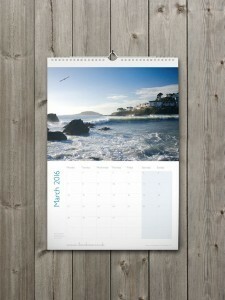 If you’d like a calendar, I delivered 10 to Looe TIC today and I have 12 left here.